The National Capital Planning Commission voted unanimously yesterday to reconsider the site and design of the proposed World War II Memorial on the Mall, unexpectedly reopening a bitter debate that had seemed closed just a few months ago. The commission voted to hold a two-day public hearing on the subject and to get advice from a panel of architects and urban planners. 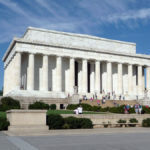 In addition, commissioners asked the National Park Service to build a mock-up of the memorial on the proposed 7.4-acre site between the Lincoln Memorial and the Washington Monument so they can better assess the structure’s scale and impact. Until yesterday’s meeting, the commission had indicated that it would focus on the narrow question of whether its former chairman, Harvey Gantt, should have been allowed to participate in votes last year approving the memorial’s design. Gantt voted even though he had not been reappointed to the panel, a problem that did not surface until a court hearing in March on a lawsuit brought by the project’s opponents. Gantt has since resigned. Supporters and opponents said yesterday they were surprised that the commission agreed to reconsider not only those votes, but also earlier votes in favor of the controversial Mall location. “There seems to be a whole new commission,” said opponent Neil Feldman, co-chairman of the National Coalition to Save Our Mall, referring to turnover on the commission and its change in attitude. “We have a chance now,” he said. Mike Conley, spokesman for the American Battle Monuments Commission, the sponsor of the memorial, said he had not anticipated that the commission would reopen the discussion so broadly and ask for a mock-up. The heated battle over the $140 million memorial has played out before various commissions since 1995. Opponents of the design have said that it will block the famous Mall vistas and that it is too large for the site. The memorial would include a sunken pool and 43-foot granite arches on its north and south ends. But most veterans organizations have strongly supported the project, saying the location is appropriate in view of the achievements and sacrifices of the World War II generation. Former senator Robert J. Dole (R) and actor Tom Hanks were among the celebrities who attended a groundbreaking for the memorial last Veterans Day. The two-day public hearing revisiting all aspects of the project will be held June 13 and 14 at commission headquarters at 401 Ninth St. NW, with the first day devoted to public testimony and the second to a commission discussion and vote. The commission voted to alter the standard rules for public testimony by limiting the memorial’s sponsor to an initial presentation of 30 minutes — in the past it had been given unlimited time — and allowing 30 minutes for opponents’ initial presentation instead of the usual five minutes. The idea of building a mock-up of the memorial to shed light on the debate was first raised last week, when four members of Congress, led by Del. Eleanor Holmes Norton (D-D.C.), wrote to the commission requesting that it pass along to the Park Service a request for a “complete” mock-up. Commission member John Parsons, who is also an assistant regional director of the Park Service, said he had been told by consultants that what the members of Congress had requested would cost $3 million and take five months. Instead, the commission voted to ask for a mock-up more in keeping with what the Park Service has done in other cases. After the meeting, Parsons said the Park Service might do something as basic as putting stakes in the ground to show the dimensions of the memorial. Of the commission’s 11 current members, four voted in favor of the World War II Memorial design in September, three voted against it, and four have not cast a vote on the project. One seat is vacant.